I've been thinking about taking the train to Chicago for a theater weekend, since I hear it's almost as good a theater town as Minneapolis/St. Paul. But I haven't managed to make it happened yet. So when I had to go to Chicago for a meeting last weekend, I jumped at the chance to see some theater. Unlike my last work trip to Southern California, where there was only one theater in town, I was faced with a plethora of plays and musicals to choose from, and only one night to see something. I didn't know how to begin making the choice, so I used the website Theater in Chicago as a guide. It lists all of the shows playing and summarizes the reviews, and even lists the top rated shows. Unfortunately, by the time I started seriously looking (the day before), most of the top rated shows were sold out. 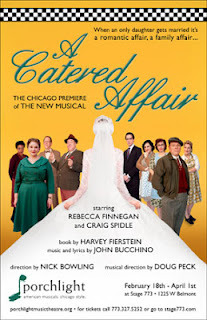 So I ended up seeing the musical A Catered Affair by Porchlight Music Theater, which also received pretty good reviews. Not the most edgy or unique choice, perhaps, but I was happy to support a local Chicago musical theater company (as opposed to the several big Broadway productions in town). And I could do worse than a musical by Harvey Fierstien (who also wrote the book for La Cage aux Folles), with music and lyrics by John Bucchino. It turned out to be a fun evening and a great entry into the world of Chicago theater. A Catered Affair opened on Broadway in 2008 to mixed reviews, and closed after a few months. Based on the 1956 movie of the same name, it's set in the Bronx in the 1950s and features a young couple who want to get married in a hurry. But not for the reason you think, they just want to skip all of the hoopla and get on with the honeymoon and the rest of their lives. The bride's mother is upset when she hears this; she wants to give her daughter a big wedding to make up for the fact that she's lived her life in the shadow of her brother, who has recently been killed overseas (I'm assuming in the Korean War). Kate reluctantly agrees to a big wedding for the sake of her mother, who herself regrets having to get married quickly (this time it is for the reason you think). The wedding plans start to get out of hand, as they often do, and to make peace the bride and groom decide to go back to the simple wedding they had planned. But it's not all a loss; the bride's parents grow closer while facing some long lingering issues in their relationship. The wedding also inspire Kate's "confirmed bachelor uncle," to move out of his sister's home and move in with the man he loves. Love is all around in A Catered Affair - young love, old love, unconventional (for the 1950s) love. This is a capable and talented cast, and makes me wish I could see more of the Porchlight Music Theatre (their next show is Jonathan Larson's pre-RENT semi-autobiographical musical Tick, Tick... Boom!, and they're also currently doing a completely improvised musical which looks super fun and sadly wasn't playing the night I was in town). Kelly Davis Wilson is delightfully earnest and spunky as the young bride. Rebecca Finnegan as her mother brings a gravity to the mostly light-hearted musical. She never lets us forget that this is a mother who just lost her son; it informs even the happy moments. Jerry O'Boyle is entertaining and loveable as Uncle Winston, a role which Harvey Feirstein played on Broadway. He also filled Harvey's (high-heeled) shoes in Hairspray for over 1000 performances on tour. It turns out I saw him perform the role in Minneapolis in 2007 (I looked it up - yes, I keep all of my playbills). The ensemble fills out the rest of the family and neighborhood with life and color. The band sounds lovely, including the strings which were seated to the left of the stage, and the rest which were for some reason hidden backstage. The show was at Stage 773, which houses several theaters and theater companies. It was a happening place; the lobby was filled with people when I left the show. I'm not familiar enough with Chicago to know where the "theater district" is, but I passed several other theaters on the way to Stage 773 (via the fabulous public transportation system). This wasn't quite the full weekend of theater I'm still hoping to do sometime, but I had a very enjoyable evening in the city. I hope to get back to Chicago sometime soon to continue to explore their huge theater scene.